About 400 metres below Carrickfergus, County Antrim, lies the only salt mine on the island of Ireland. Every year, 500,000 tonnes of salt are brought from its depths and sent all over the UK and as far as the United States to grit roads for winter. It has been mined since 1965 but the Kilroot site is 220 million years old. It was formed back in the Triassic period, a land-locked sea that evaporated over millions of years. The seam of salt now being mined stretches from County Antrim all the way across the north of England to north-east Europe and towards Russia. The Department of Infrastructure is one of the mine's biggest customers. It spends £5m to £6m on its winter operations each year, and between £1m and £2m of that is spent on road salt alone. Image caption The minister said while his department grits 80% of roads in icy weather, it is "not feasible" to cover every road. Infrastructure Minister Chris Hazzard said the annual purchase of 70,000 tonnes of salt was "vital" to Northern Ireland's road safety. "When you think of the lives saved by the likes of using this salt, when you consider that some of these salt boxes can help elderly people get about their local village or whatever, it's very, very important and it's an important role that I have in my department," he said. Mr Hazzard said that if the weather changes, his department is prepared. "130 gritters are all ready, 300 staff are on standby," he said. "The weather can turn at any moment and we're ready for it," he added. The minister said that while his department grits about 70,000km or 80% of Northern Ireland's roads in icy weather, it is "not feasible" to cover every road. Appealing to drivers, he said: "We know at this time of year, conditions can make driving very, very treacherous. "We know if it's wet weather, for example, your braking distance is maybe twice as far. "In icy conditions, it's maybe ten times as far - so the message is, 'yes it's great that we can salt and take these measures but drivers need to take that wee bit of extra care themselves too'." Winter is the busiest season at the mine but 40 staff are based permanently underground drilling, cutting, blasting and crushing the rock salt before bringing it to the surface. Ryan Carroll, from Irish Salt Mining, said that while demand is seasonal they are an "all-year round company". "We're mining all year, building up stocks for the winter ahead. "We do get mild winters, and on those occasions we just keep mining at the same rate and stockpiling for any harsh winter that follows." So what is it really like to work in a mine every day? Mr Carroll said: "Well it takes a bit of getting used to, it's maybe not everyone's cup of tea but the guys have been here a long time and they get used to the darkness." Should the mine ever run out of salt, it could have another use as a filming location. Its vast caverns and pillars have caught the eye of several film producers, and it recently provided the backdrop for BBC Northern Ireland drama The Fall. Mr Carroll said: "We recently did a short clip for the last series of The Fall with Jamie Dornan, a getaway sequence in the tunnel, that was one of the first main ones and we've had several others over the years as well." 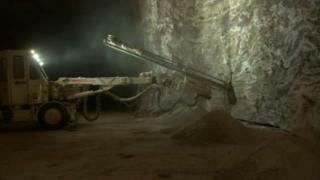 But stopping the drill for rock salt in Northern Ireland is unlikely to happen any time soon. The site is so large that it can be mined for at least another 25 years. Image caption The site is so large that it can be mined for at least another 25 years.